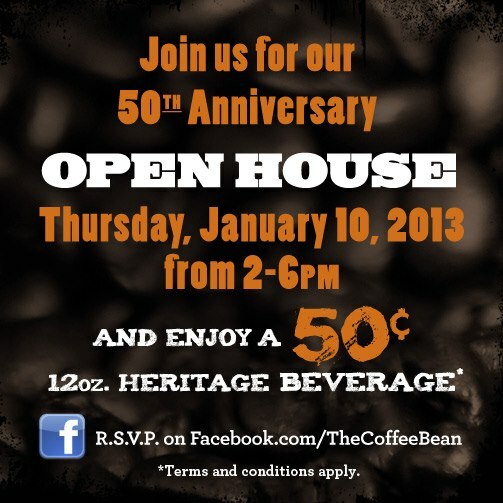 On Thursday, January 10th from 2-6 pm, in accord with the coffee shop's golden anniversary, all local participating Coffee Bean locations will be serving 50 cent so-called "Heritage Beverages." The three discounted 12 oz. drinks include the Chai Tea Latte, English Tea Latte and English Toffee Ice Blended. Find your nearest CB location here. And just as Coffee Bean is wont to celebrate themselves, we here at Unemployed Eater are wont to Live Tweet these occasions (probably much to the chain's chagrin). Follow us on Twitter throughout the celebration as we once again live tweet from our nearest Coffee Bean all the sights, sounds and incredibly freaking stupid things people do for cheap coffee drinks (#CB50th). Too bad, I've read this poster late. I bet they served variety of coffee drinks there, perhaps they also have a coffee mixed with tea or some floral flavored drinks in it. As far as I know, it's one of the latest trend right now. I wonder what are the coffees they've served in this event. I wish you held another event just like this one and I'll make sure to attend this one. It has become much easier to buy coffee beans from the reliable online stores, as they assure high quality supply and fast delivery of your order. Nice to hear this information but its to late. I will held this in jan 2016 surely. Thanks for sharing.